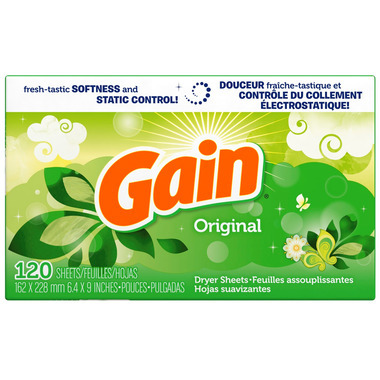 Gain Original Fresh Fabric Softener Sheets are cool and crisp with intangible charm. One sniff and you'll understand why it's the scent that started the phenomenon. Gain has the nicest smell you'll love it on your clothes. they do the job the smell is not overpowering its lovely and long lasting slightly biased i just love the gain smell in everything the produce , keep it going procter and gamble!! Love the smell, very fresh and i can use them even as air freshner, one of my favorite brand. I love the scent. My clothes comes out of the dryer smelling clean and fresh. They smell quite strong, very fresh. I could smell these as I walked up to my front porch and found the well.ca box on my doorstep. I love Gain laundry detergent, but these are way too strong! I couldn't even leave them in the house! I didn't try to see if they actually work well. Love the smell of Gain! The smell lasts on my clothes, and they come out of the dryer static free. Definitely will keep buying these sheets! I love these dryer sheets. They smell fantastic, and the smell lasts! They also leave my clothes static free and soft. I buy this product again and again. I love it, it smells so great even a better smell when i just hang my clothes to dry. Nice scent in my opinion. . If I could scent everything in my life with original Gain, I'd be a very happy person! these make my whole laundry room smell AMAZING! I love it, it smells so great even a better smell when i just hang my clothes to dry! Strong scent, clothes smell really good! Gain makes me terribly sick. It's so toxic! I use a sheet in the bottom of my garbage can, and it covers any nasty smell.